Halong is famous all over the world for the majestic beauty of the dense rocks and islands, and the natural caves in the centre of Halong Bay. It is twice recognised as a World Natural Heritage Site by UNESCO. According to local legend, ever since the first settlement of the country, Vietnam has been attacked from the sea. Knowing this, the Jade Emperor sent Mother Dragon and her child down to help the Vietnamese against invaders. When enemy ships were approaching, the dragons flew down from the sky and spat countless pearls into the sea. These turned into a myriad of jade islands. They linked together to create a solid wall that blocked the approaching enemy ships. These crashed into the rocks and were torn into pieces. After driving away the invaders, the Mother Dragon and her child were so charmed by the beauty of the bay that they decided to stay rather than returning to heaven. 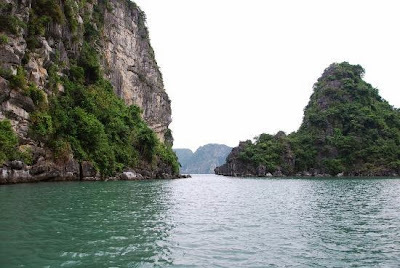 Where the Mother Dragon landed was called Halong, her child settled in Bai Tu Long Bay, and where their tails writhed is called Bach Long Vi. Halong Bay was formed by millions of years of geological changes, which created thousands of islands. Hidden inside these are beautiful caves such as Sung Sot Cave, Thien Cung Grotto, Thien Cung, Trinh Nu and Thien Canh Son Cave. Recognised by Unesco as a World Natural Heritage for its biodiversity, geology and local culture, Halong Bay’s beauty and charm make it an attractive tourism destination. The landscape of Halong is always attractive, with each season bringing its own colours.